Experiences from the spiritual dimension can be both good and bad. Up to now most of the experiences we have documented in this section have been positive experiences. In this particular case, we have a seeker of the Spiritual Science Research Foundation (SSRF) who had a negative subtle-experience in the form of a foul smell. As a part of their spiritual practice seekers meet on a weekly basis to study and discuss their efforts and obstacles in spiritual practice. 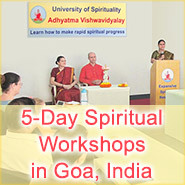 This also helps to sustain their spiritual practice and spiritual development by making it consistent and progressive. 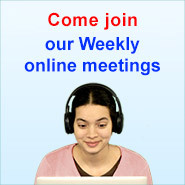 Meetings such as these are referred to as a satsang. Personally, I had experienced a qualitative improvement in my spiritual practice in the days immediately after attending a satsang. Due to my work, I often travel to various parts of the United States and India. Wherever I am, I try to make it a point to attend satsangs on a weekly basis. The Spiritual Science Research Foundation has centers in various places in the United States and India, thus making it possible for me to avail of satsangs conducted by them during my travels. On one of my assigned projects, I had to visit Bloomington, Illinois and during my stay there I would attend the weekly satsangs. One day after work, I was eagerly looking forward to attending the weekly satsang at a fellow seeker’s residence. Just before we started the satsang, we suddenly started smelling a foul odour. Due to the smell, we started feeling nauseous and restless. As there was no apparent source or cause of the foul smell, we suspected it to be the handiwork of ghosts (demons, devils, negative energies, etc.). We immediately resorted to a spiritual remedy to overcome the problem. We performed a type of spiritual treatment to spiritually cleanse the house by sprinkling Holy water (Tirtha) (i.e. water mixed with Holy ash) around the house. As soon as we started sprinkling the Holy water in the house, we felt the foul smell vanish instantly. The subtle intangible pressure in the atmosphere reduced. We began to feel a distinct lightness in the atmosphere. We could then conduct the satsang without any further obstacles. One of the main objectives or goals of ghosts (demons, devils, negative energies etc.) is to create obstacles in the spiritual practice of seekers when trying to spread spiritual understanding. The weapon that is primarily used by them is distressing energy which is spiritual in nature. They use various media to spread distressing energy and in this case they used the medium of foul smell. In order to manifest the foul smell, ghosts use the Absolute Earth Principle (Pruthvitattva) . Refer to the article – What is the objective of the ghosts’ (demons, devils, negative energies etc.) existence? The foul smell has an immediate effect on the brain cells and creates a distressing covering around the mind and intellect thereby causing restlessness. As a result, there is a blockage in the flow of the thoughts process, causing mental instability and confusion. Due to this, there is a lack of concentration in whatever the seeker does, thus decreasing the capacity of the seeker to do his work. Slowly this ill-effect spreads throughout the seeker’s consciousness and the seeker’s vital energy (Prāṇa-shakti) gets depleted . Through such attacks, ghosts try to create mental distress, doubts and fear in the seekers. All attempts of the ghosts (demons, devils, negative energies etc.) to attack are powerless in the presence of Divine energy. As seen in the above experience, when Holy water was sprinkled around the house, the foul smell created by the ghosts was immediately destroyed thus removing all traces of the distressing energy in the atmosphere.